The 2019 Chevrolet Corvette ZR1 is the fastest production Corvette ever created. Thanks to its hand-built 6.2-liter LT5 engine, it can go from 0 to 60 in a mere 2.85 seconds and has a top speed of 212 miles per hour. The folks at Hennessey Performance must think that’s too slow. That’s why they’ve introduced the Hennessey HPE1200 supercharged engine upgrade. The Hennessey HPE1200 supercharged engine upgrade is available for the 2019 Chevrolet Corvette ZR1. This upgrade includes several performance upgrades including a high-flow supercharger system, custom HPE camshaft, and upgraded intake valves and exhaust valves. 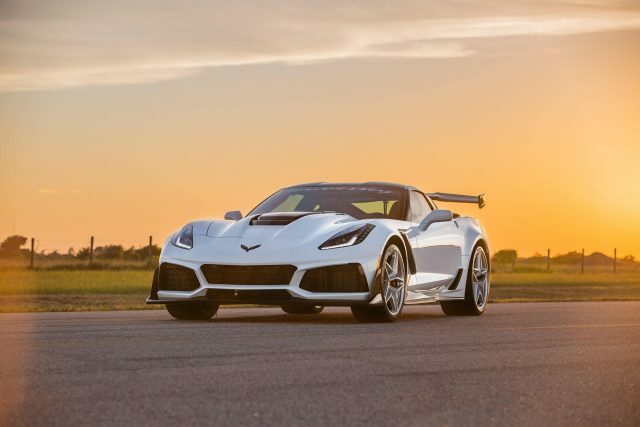 This upgrade transforms the already potent ZR1 into a time-bending supercar capable of 0 to 60 times of 2.2 seconds and a quarter mile run of 9.2 seconds. Oh, did we mention the upgrade boosts horsepower to 1,200 bhp and raises torque to 1,066 lb-ft? Top speed also increases to 230 plus miles per hour. We’re not sure what this kind of power costs, but it’s a good chance the people at Hennessey can work that out for you. Give them a call at 979-885-1300 or shoot an email to sales@hennesseyperformance.com.